On a field Azure an stone tablet Natural is charged with an inverted trident Or, crossing a kelp frond Or from which sprouts in lieu of pods, droplets Argent. The blue field denotes the house's solidarity with the Rebma Throne. The tablet signifies their devotion to the written/chiselled word and mysticism, with the trident doubling as a runic symbol. 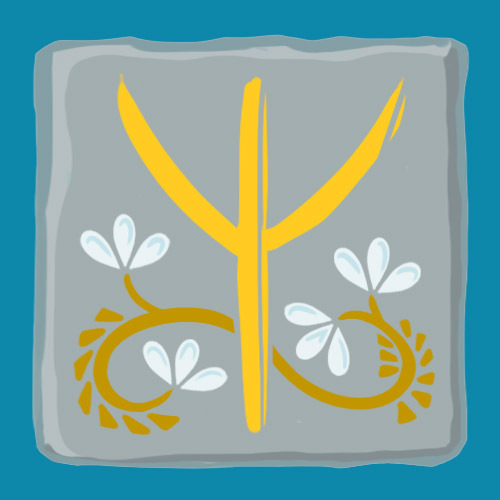 The trident also symbolizes their bond with Lir even though he has been absent for two millennia. The kelp frond hearkens to the forests around their ancestral stronghold, and the droplets stand for both the kelp wine they brew and their famous alchemy. House Dilwen fulfills many duties which are of value to Rebma, none of which are military or even adventurous in nature. The most daring Dilwens have joined the diplomatic ranks at the handful of Embassies Rebma has established outside the realm. Otherwise, the House membership cleans up nicely in reclusive, spiritual or spiritual pursuits: as clergy within the Priestesshood of the Cult of Lir, and as senior researchers and historians in the Great Archives and other vaults of relics and lore. The latter has necessarily led to practical applications in alchemy and mystic rune-making. Where Bauquemare seeks out artifacts and lost lore, Dilwen studies, catalogues, and keeps them safe. They claim to hold Lir's Trident as a sacred relic. Rebman Opalwood - Through a series of treatments, wood can be transformed into mineral, beautifully marbeled in hue and as strong as composite steel. Blood Coagulant - Addressing the wartime issues of blood loss, water contamination, and predator baiting, the substance is released to seal wounds, bind with blood to remove it from water, and prevent its attracting every hungry shark in the region. It is fitting the first and oldest of the noble houses would also be the records-keepers and staunchest guardians of history. Many disciples of Lir were Dilwens, and from that prestige grew influence and wealth, with which they struck an alliance with the first Queen Under The Waves, Manawydan, supporting her dream of consolidation as she validated the Cult of Lir's as the One True Religion of Rebma. For their early wisdom and faith, the Dilwens were raised to nobility by Manawydan and to this day remain unwaveringly loyal to the Royal Family. The ancestral territory is an elevated stratum to the far west, south of the Ygrayne March. Just close enough to see a small handful of hours of daylight from Amber sun's, the plateau is uniquely forested with giant kelp systems around the edges, which gives the stronghold and supporting villages even more of the seclusion the family loves. An extensive monastery and distillery is similarly hidden within the March of Dilwen. Their famous Kelp Wine is a dinnertime staple throughout the realm. Dilwen's manor house in Rebma City still looks remarkably similar to the Chantris Manor in Amber, housing a marvelous private library of unique runes and tablets. An attached compound takes up the rest of their Upper City cliff, and therein wondrous feats of alchemy are achieved. Particularly sought-after are their Rebman Opalwood treatments: A schedule of potions which will turn an average tree trunk into a gleaming blue pillar of dense mineral. It is whispered but never openly confirmed that the Order of Eilrahc, protector-knights and inquisitors of the Cult of Lir, are financially linked to the Dilwen family. Even though a member of House Bauquemare committed a grave offence against one of theirs, House Dilwen had been loathe to hold a grudge against those who find the relics and snippets of lore that is Dilwen's raison d'etre. Luckily, Martin has negotiated on their behalf to see that rightful restitution went to them without them having to demand it. There is a veiled mistrust of House Dilwen by the Ygraynes, Dafydds, and Bauquemares, due to a recent deathly respiratory illness that struck historians working in the Great Archives, members of the aforementioned families, while leaving the senior staff unharmed. The House claims friendship with Princess Llewella by her previous marriage to Lord Wynn. The House's standing with the Queen and Crown Prince is currently good. Anjali - A Historian, Mirror Mage, and artist. She enjoys inking tattoos, studying someone else's work, and chasing down rumours of historical significance in Shadow. Caddell - Son of Princess Llewella and Lord Wynn Dilwen. Attache at the Rebma Embassy. Morgana - Daughter of Princess Llewella and Lord Wynn Dilwen. Former Ambassador to Rebma. Beladora Dilwen, current House leader, quiet and reclusive though her wisdom is greatly valued. Elisadea Dilwen, eldest daughter and Beladora's heir, said to be an efficient and responsible woman. Owain Dilwen, the late Prince Consort, father to Morganthe, grandfather to Martin. Lyder Dilwen, a reclusive young Lady of the house and a notable historian. Tanwen Dilwen, mother of Wynn Dilwen, sister of Marchioness Beladora. Wynn Dilwen, late husband of Llewella and father of Morgana and Caddell.